It was getting on towards late afternoon, and Tom and I were nearing the end of a successful day's church exploring in the extreme north-east of Norfolk. Virtually every church up here is kept open every day, and those which aren't are willingly opened by their caring churchwardens. 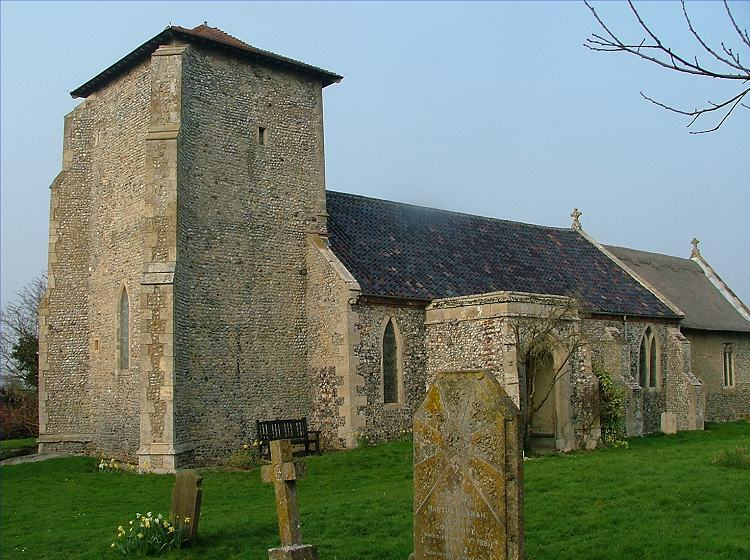 There is a real impression in this part of Norfolk of churches held by the communites to be more than mere worship spaces, but sacramental structures, folk museums and touchstones down the long generations. I liked them all a lot. We had visited everywhere we'd planned, but there was still an hour or so of daylight left. 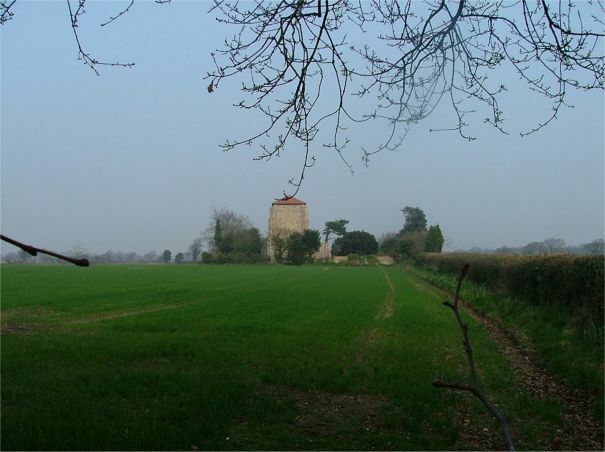 Suddenly, off in the fields to the left, I saw a long, low structure with a truncated roof. I looked on the map to see that it was the parish church of Crostwight, although there appeared to be no village, hardly any houses even. From the map I could see that there was an old rectory about a quarter a mile from the church, beside the lane, but even in early Spring it was so tree-surrounded as to be barely visible until we actually reached it. "Five pounds says it's locked", warned Tom, risking his exhaust by driving up to the graveyard along an old track. And he was right, but the key was back at the old rectory, where the keyholder was very friendly and welcoming. 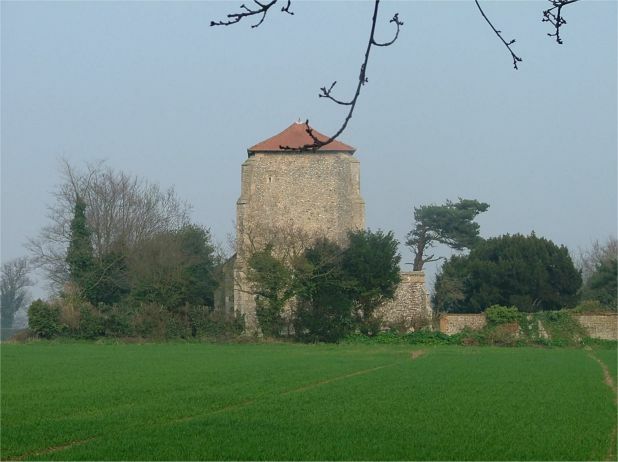 As I wandered back up to the church, I looked at the curious low tower. It was taken down in 1910, after a covering of ivy had made it unsafe. The bells were rehung lower down. We unlocked the door, and stepped inside. An ancient space. A wide nave; pale, rustic, full of creamy light. A medieval screen, golden in the afternoon shadows. And then, treasure. This is the best kind of discovery - late in the day, unexpected, unsought. For All Saints has one of the most extensive schemes of late medieval wall-paintings in East Anglia. I hadn't even known about them. 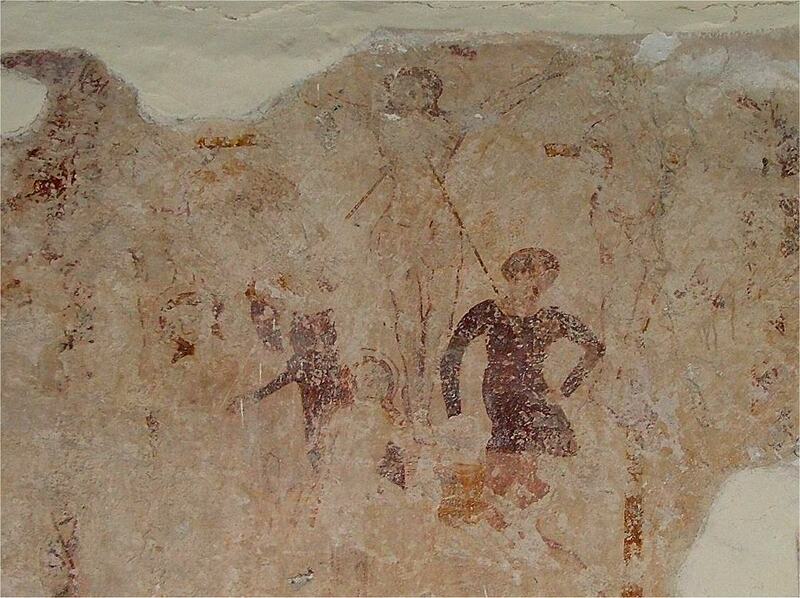 It runs along the north wall, and probably dates from the later part of the 14th century, perhaps the early 15th. The scheme is essentially doctrinal in nature, part of the enforcement of Catholic orthodoxy at that time in the face of local superstitions, perhaps as a response to the effects of the Black Death. 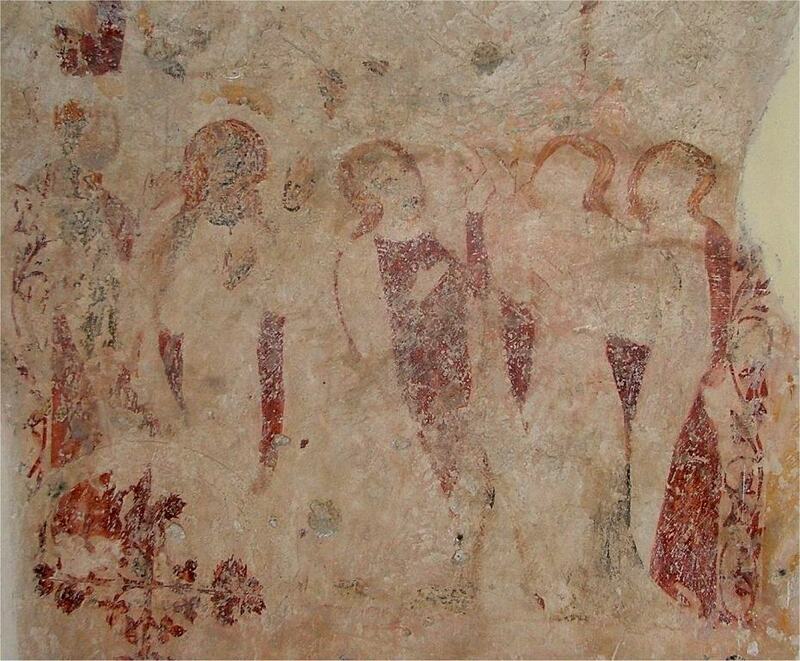 The Passion sequence of wall-paintings is the most remarkable. It runs at three levels on the north wall of the nave between the two windows. 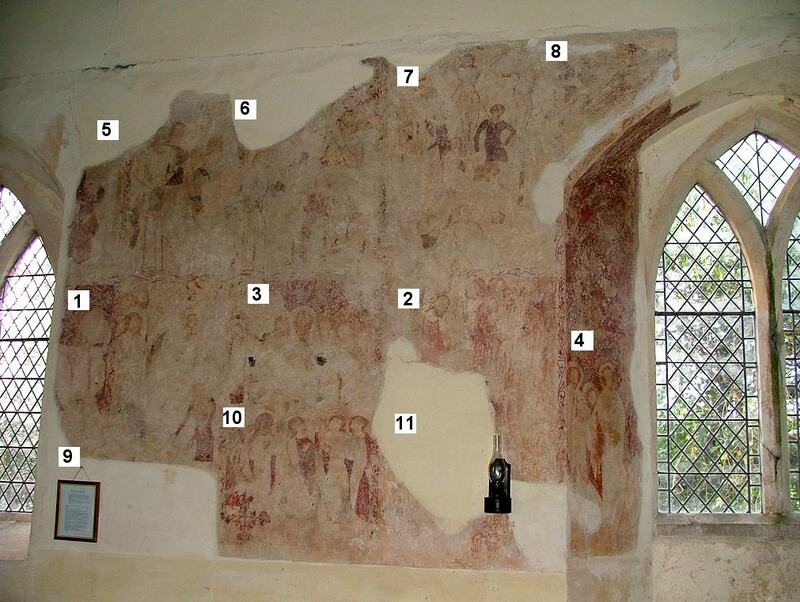 The arrangement is rather complex, and several of the panels are hard to decipher, so I have numbered the sequence on the large photograph immediately below. If you click on it, you can see it enlarged. Below it, the individual panels are organised in thumbnail form. If you click on any of them, you will see that panel enlarged. 1: The entrance of Christ into Jerusalem. Overall, this is the largest panel, drawing the eye to the start. 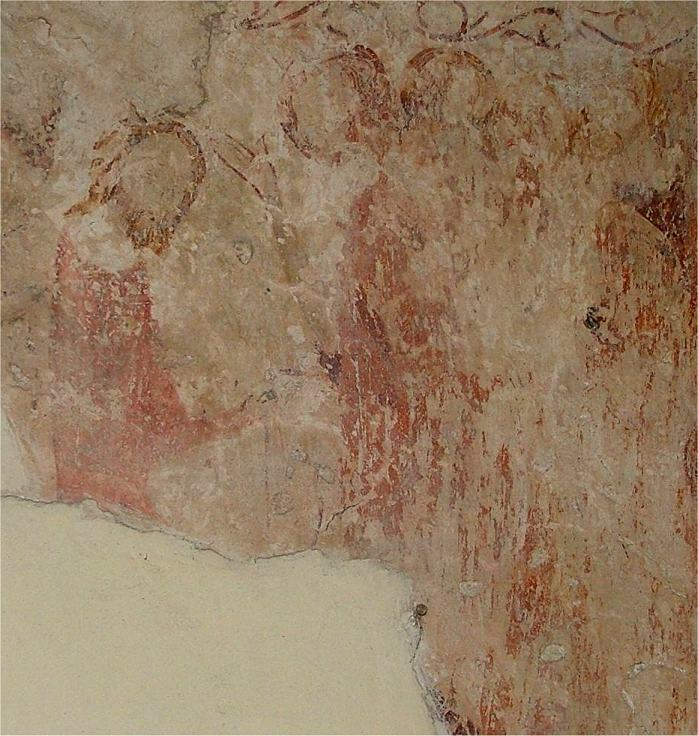 2: Christ washes the feet of his disciples. 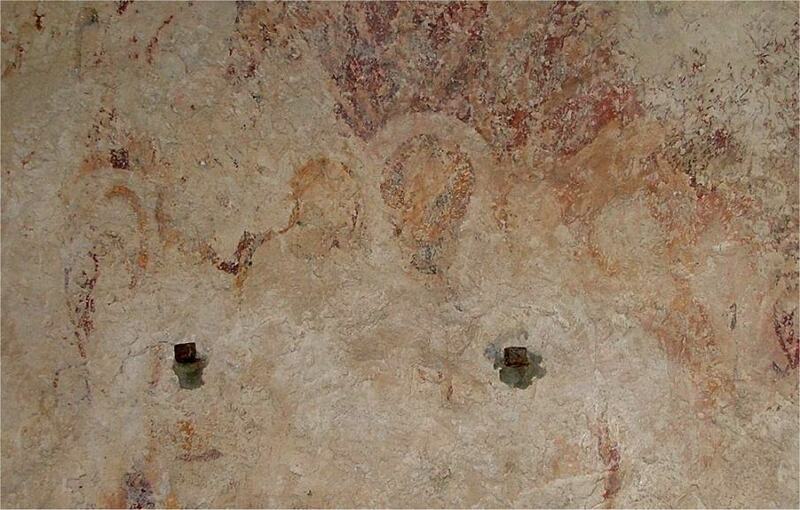 3: The Last Supper - Christ in the centre, John on his right. Little remains of this panel. 4: Christ prays in the Garden of Gethsemane. Perhaps the most haunting panel, in a window splay. 5: Christ is arraigned before Pilate. 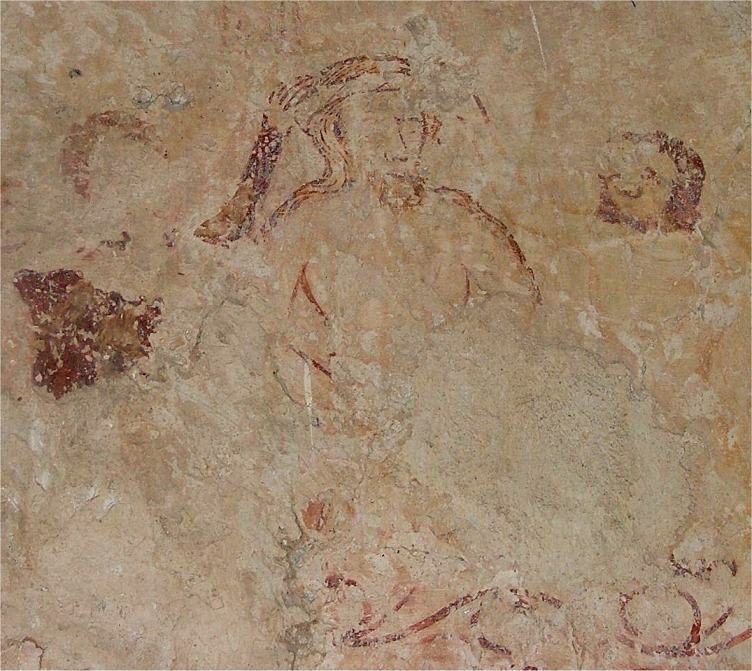 6: The scourging of Christ. 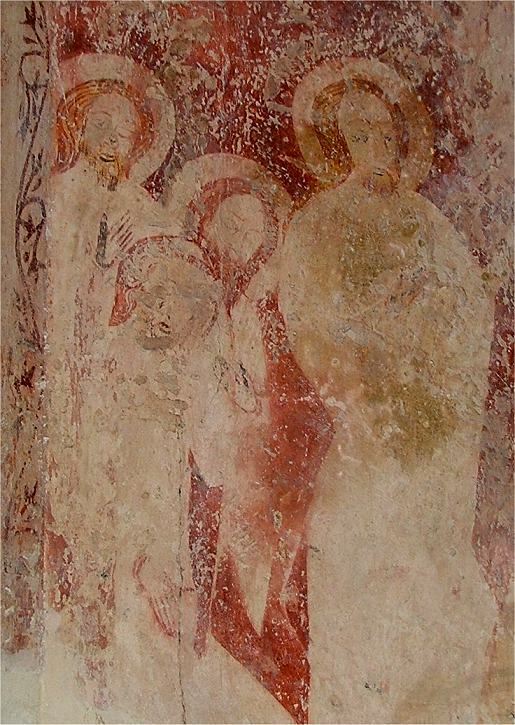 The top half of the bound Christ is missing. 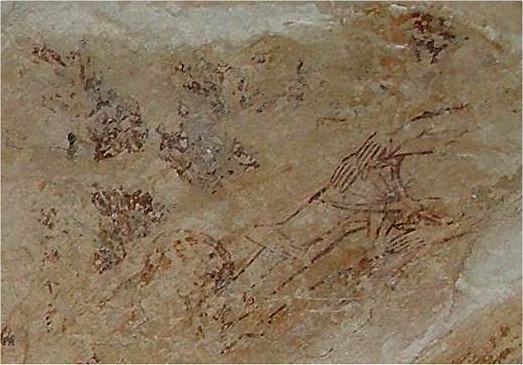 7: The Crucifixion. Christ is crucified, a thief on each side of him. 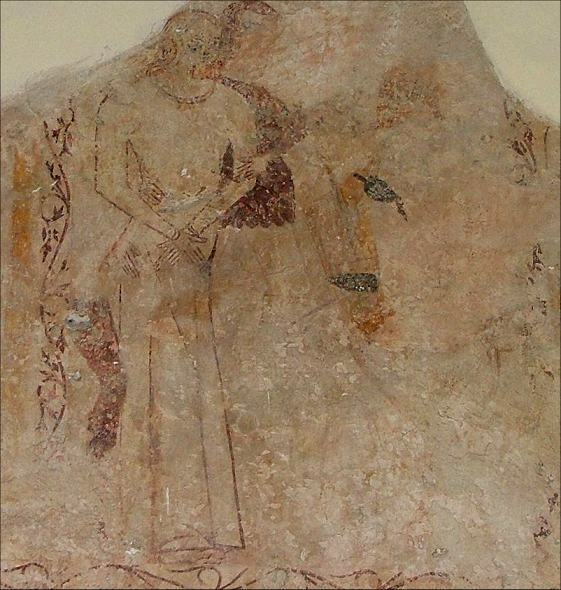 Below, Mary weeps, Longinus pierces his side, another soldier offers him vinegar on a reed. At the foot of this panel is the Crowning with Thorns. 8: The Deposition. 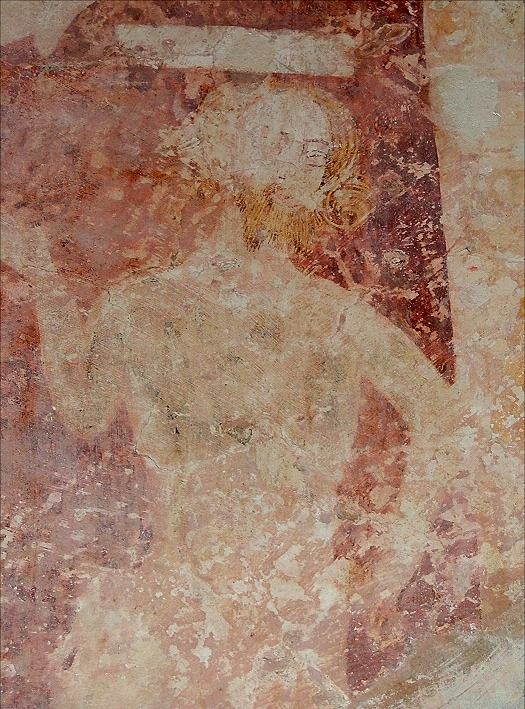 Christ's naked body is laid out - curiously, this panel is arranged awkwardly above the window. 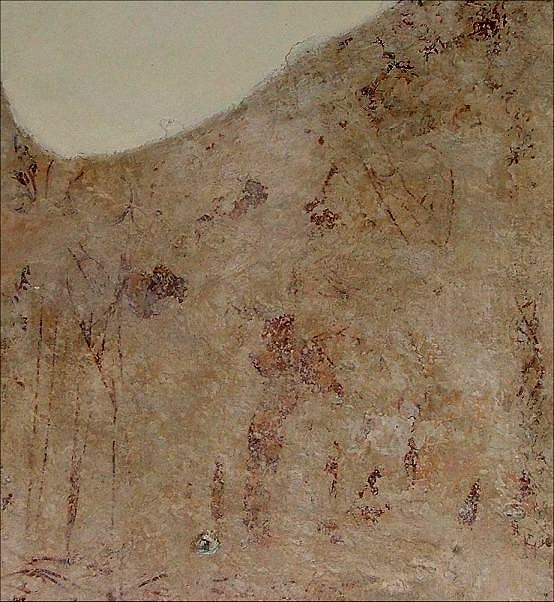 9: The Resurrection. Completely lost, but it must be at this place in the sequence where the blank wall is. 11? 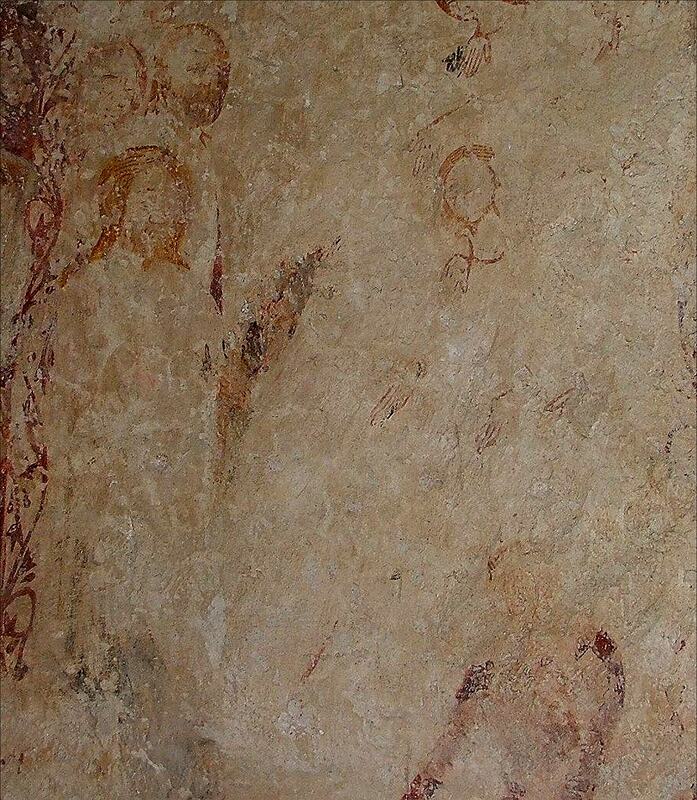 :Although the wall is blank to the east of the Ascension image, there is space for one more panel, which may be Christ sitting at the right hand of the Father, or possibly the day of Pentecost. At the foot of the Crucifixion panel: Christ has a crown of thorns placed on his head. Christ is crucified, a thief on each side of him. 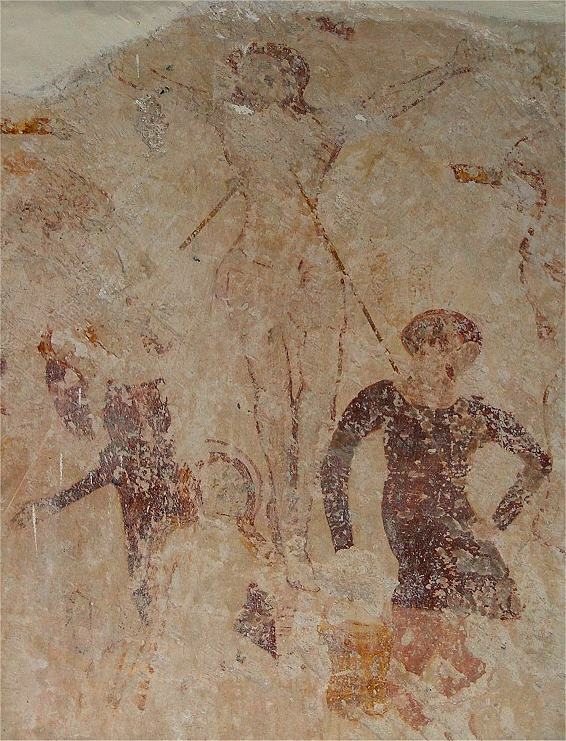 Below, Mary weeps, Longinus pierces his side, another soldier offers him vinegar on a reed. 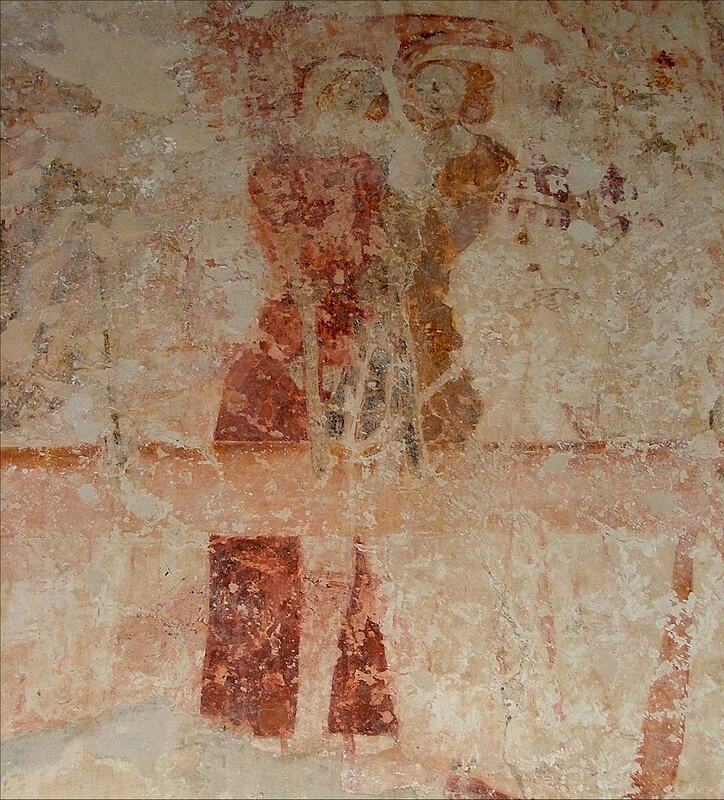 There are more wall-paintings to the west of the window. These are also fascinating. At the extreme west is a depiction of the Seven Deadly Sins - a tree grows out of the jaws of hell (represented by the mouth of a giant fish) and the sins grow on it as fruit. The jaws are full of sinners, being pushed down into hell by a devil. To the right of this is a very curious painting. It appears to show two women being welcomed by an angel at the gates of Heaven, with what may be a devil low down looking on. Pevsner thought it was a warning against gossip as at Seething, but I don't think this can be right. 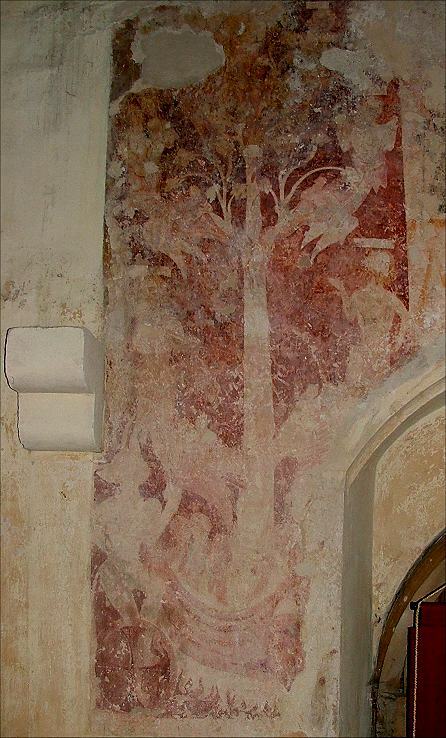 Anne Marshall, of the Painted Church site, suggests that it is similar to a painting at Swanbourne in Buckinghamshire, which depicts the allegory of the penitent and unpenitent souls. 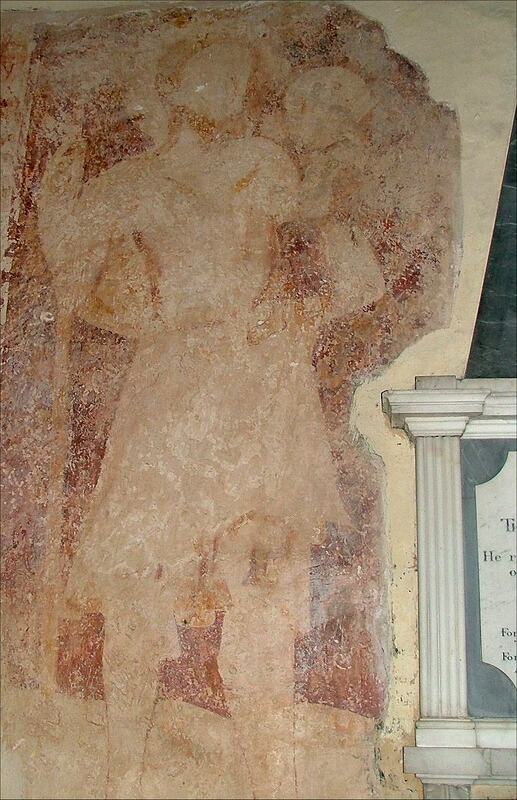 Immediately to the right of this is a much more familiar image, St Christopher. Finally, an unidentified Saint, a scroll above his head. The screen is a gorgeous chestnut brown, but I was not entirely convinced it is as original as it appears. 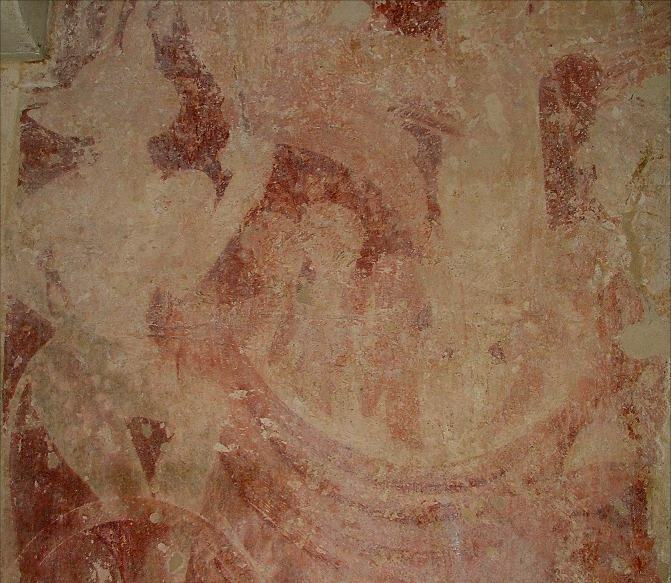 The carving in the spandrels in particular, while fascinating, depicting dragons, wild men, flying hearts and the like, does appear to be modern, at best recut. And, curiously, while the chancel arch itself retains extensive painted decoration, there is none on the screen at all. As with many churches around here, All Saints has an octagonal Purbeck font reset on collonaded pillars. This one is in very poor condition, and must have spent a long period out of doors at some point. But its worn and fractured faces somehow add to the atmosphere here. This is a simple, rural church in a tiny parish - barely 700 acres, and certainly no more than a hundred people. It sits a quarter of a mile from the nearest road and from the nearest house. There is no electricity. It has, in modern eyes, no real reason for existing anymore. But it is well-kept, used regularly, and obviously much loved. Hubert Arthur Francis was the only man from the parish to die in World War Two. Today, he has a memorial as grand as any you'd find for Lords of the Manor. And beneath it, his photograph in a simple frame. Still remembered. That, for me, made it all the more special.